Save the Cord Foundation is proud to partner with the Arizona Department of Health Services, Arizona Biomedical Research Commission to provide Arizona with a public umbilical cord blood banking program. It is free to donate your newborn’s cord blood to this program. 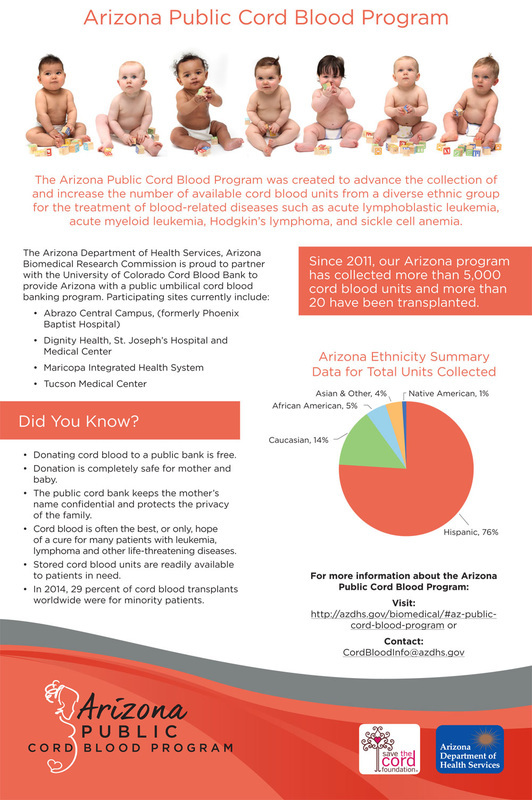 The Arizona Public Cord Blood Program was created to advance the collection of and increase the number of cord blood units available for transplantation. Currently, seven out of ten people will not have a suitable matched donor in their family and will depend on the National Marrow Donor Program (NMDP) registry to find a match. Adding diverse units to the registry increases the likelihood that all patients will find a match. Download the Cord Blood Education Poster from AZ Department of Health Services and Save the Cord Foundation.